I love this cooler weather! It's been a bit hot the last few days for me to venture out birding. I've done my best to sit diligently at my desk, but sometimes it's been too hot for that too. February has seen me birding at the Organ Pipes National Park, Lillydale Lake, Dandenong Ranges National Park (both Ferntree Gully and Sherbrooke), Blackburn Lake, and, best of all, Melbourne Water's Western Treatment Plant aka Werribee Sewage Farm. Despite this (I think) impressive list, I have only managed to see 108 species of birds this month, making a total of 142 for the year. Highlights for February were four Brolgas flying overhead, calling and landing quite close and an usually large number of Red-necked Avocets (what elegant birds!) both at Werribee, a Bassian Thrush at Sherbrooke and Rufous Fantails at both Ferntree Gully and Sherbrooke. March promises good birding. I'm going to wimp out of Boneseeding at the You Yangs (sorry, Merrilyn!) The traffic on the Geelong Road going to the Avalon Air Show has put me off. But I am going to Chiltern (site number 5 on my 100 top Australian birding sites) and I'm planning to do my first pelagic for the year out of Port Fairy. I can hardly wait. Melbourne has had a few horribly hot days, so when today's forecast was for an enjoyable 27, I couldn't resist the temptation to go birding. I went to Sherbrooke Forest, which is at the other end of the Yarra Ranges National Park (where I was last Friday at the Ferntree Gully end). It comprises tall wet eucalypt forest with fern gullies, and is famous for Superb Lyrebirds. I was greeted in the car park by Crimson Rosellas and Eastern Yellow Robins. The robins were very friendly and they were everywhere. I lost count of how many I saw this morning.﻿ Two Eastern Whipbirds flew across the track before I'd even locked the car, giving me excellent views. (If only Western Whipbirds would be so cooperative!) I set off slowly, enjoying the sunshine and the bird song. I wrote down ten species straight away, one after the other. The best (apart from the whipbird) was yet another Rufous Fantail. I took the track to the falls and I must say it was extremely pleasant. The temperature was perfect, the birds were singing and there weren't too many joggers. Cockies squawked overhead and kookaburras laughed for the simple joy of being alive. I couldn't help feeling guilty (I should be at my desk, working) but the morning was too good to ignore. I had a good look at a White-throated Treecreeper, as Red-browed are also a possibility here. Scrubwren hopped across the track, as well as the ubiquitous robins. I put my glasses up to admire one larger bird on the ground, and saw a beautiful Bassian Thrush. Icing on the cake! Today I made my first visit to Werribee for the year. The number of Australian Shelducks, Purple Swamphens, Pink-eared Ducks and Red-necked Avocets was phenomenal. There are always huge numbers of Grey and Chestnut Teal. There is always something exciting at Werribee. 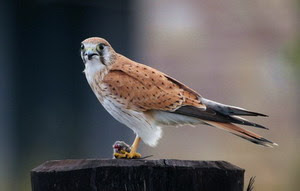 At the T-Section Lagoons, we saw three Zebra Finches and one Brown Songlark, as well as one mystery bird. This unidentified wader has me stumped. 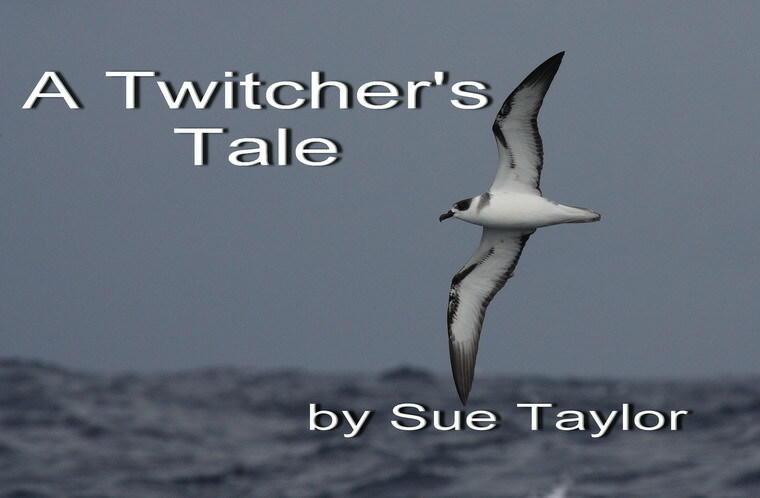 It was about the size of a Sharp-tailed Sandpiper, with a stout, very slightly upturned bill and an obvious white eye-ring. There was no supercilium. Underparts white, splotched on the back and wings and a striated head. This bird simply doesn't exist according to the field guides. Yet I saw it. The uncooperative creature flew before I could examine it further, so I didn't see leg or tail colour, and I was busy consulting my field guide and didn't see it fly. 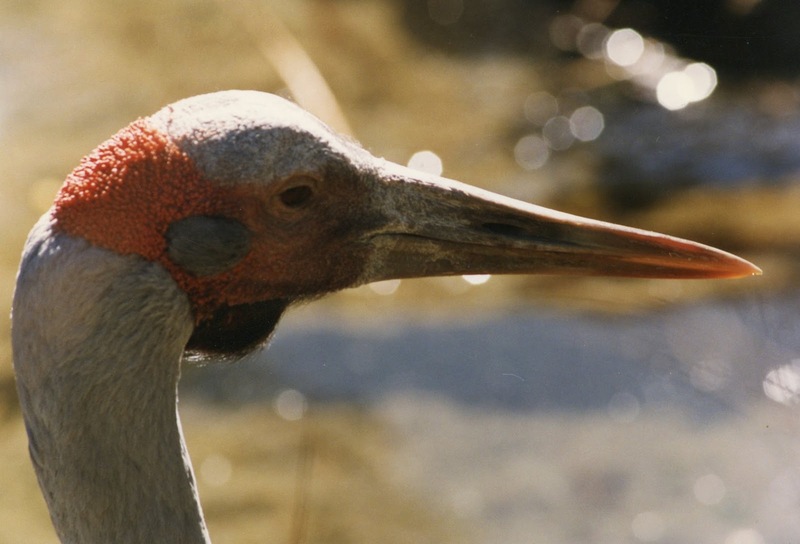 Another highlight today was hearing and then seeing four Brolga - such beautiful big birds. We saw seven Australasian Darters - unusual for Werribee, and a flock of about a dozen Black-tailed Native-hens at the Borrow Pits. A great day as usual. Werribee never lets me down. Today, Friday 15 February, is the first day of the Great Backyard Bird Count. The temperature in Melbourne is forecast to be 33, so I decided to get an early start and try to clock up some birds before it became too hot. I decided to go to the Ferntree Gully section of the Dandenong Ranges National Park. I selected this spot today because (1) I hadn't been there before this year, and I'm always hoping for some new species for the year and (2) I hoped that it wouldn't be too hot beside the creeks and amongst the ferns. Ferntree Gully is about 30 kilometres south-east of Melbourne, so I had the sun in my eyes as I drove out there. I arrived at 8.05 and was shocked at the number of cars in the car park. There must have been over a hundred. Why weren't all these people at work? Joggers like to train on the Kokoda Trail. It is steep and taxing. I walked the Nature Trail, which is 3 kilometres and is supposed to take 1.5 hours. It took me a little over two. I had the trail entirely to myself. Apart from the birds and some wallabies (and a disconcerting noise from some long grass) there was no other life along the Nature Trail this morning. As soon as I got out of the car, I was bombarded with cockies squawking. They were loud, raucous and omnipresent throughout my visit. I'm sure they stopped me hearing twitterings from other birds. For the Great Backyard Bird Count, participants must submit the number of each species present. I estimated that there were 100 Sulphur-crested Cockatoos. The next most numerous species was the Crimson Rosella. I recorded 30 of these.﻿ After that came Little Raven (12 - hanging around the car park), White-browed Scrubwren (8), Superb Fairy-wren (8), Grey Fantail (7) and Eastern Yellow Robin (also 7, probably more, I was seeing them and hearing them a fair bit, but I only counted the ones I saw). I saw just one female Golden Whistler, one beautiful Rufous Fantail and just a couple of kookaburras. I spent many minutes looking for White-throated Treecreepers, which were very common, judging by their calls. I came home without seeing one. In my defence, I point out that the trees are very tall here! I saw both Striated and Spotted Pardalotes, Silvereyes (of course) and, surprisingly, one Large-billed Scrubwren. So now I've seen two birds this year in both January and February, that I did not see for the whole of 2012: the Rufous Fantail and the Large-billed Scrubwren. I submitted a list of 23 birds to the Great Backyard Bird Count. Not all that impressive, I hear you say. Well, watch this space: tomorrow I'm going to Werribee Sewage Farm. This is site number two on my top 100 Australian birding sites and I have Great Expectations. Yesterday I visited Lillydale Lake. Lilydale is located 35 kilometres north-east of Melbourne. (Yes the town is spelt differently from the lake!) The lake is huge - some 28 hectares and it is set in a park of over 100 hectares. The Olinda Creek runs into the lake, and is filtered by wetlands, which of course was where I was headed. I was there at quite the wrong time of day (I arrived at 1 p.m.). It was hot. But I still managed 31 species and some very good birds. As I drove in, I noticed a nice muddy drain, and made a note to have a good look at it before I left. Noisy Miners greeted me in the car park and White Ibis on the lawns gave every indication that picnickers were ignoring the signs asking people not to feed the birds. Welcome Swallows performed aerobatics overhead, then landed in a dead tree. On closer inspection, I saw that there was a good number of Fairy Martins mixed in with them. There were several Australasian Darters: some playing scarecrows, some swimming in the lake and croaking loudly. There's a boardwalk through the wetlands, and I walked along it slowly. I'm sure the temperature was higher than the forecast 27. There's a jogging track around the lake, which is very popular, but few people bother with the wetlands. That suits me fine! I could hear Spotted Pardalotes, but they were high in the canopy of the gum trees and took some finding. But find them I did, and they were certainly worth it. I walked to the weir and saw a very odd duck. It was like a Hardhead without a white eye and with a green speculum. I decided it must be a hybrid between a Hardhead and a Pacific Black Duck. Black Ducks are notoriously randy - they'll mate with anyone! On the muddy verge, I disturbed a Latham's Snipe. It flew right in front of me, giving me a great view. Fairy-wrens and scrubwrens played in the undergrowth and kookaburras laughed at me. Young Purple Swamphens, fully grown and apparently quite capable of feeding themselves, begged their parents for an easy feed with an irritating and very noisy persistency. Very pleased with my beautiful pardalotes and snipe, I thought it was time to go. I remembered to check out the muddy drain on my way back to the car. There I saw a Black-fronted Dotterel and an Australian Spotted Crake, both out in the open, happily foraging in the mud. A fine note to end on. I thought I'd start February's birdlist off with a bang with a visit to the Organ Pipes National Park. This park is 85 hectares of regenerated vegetation based around some spectacular basalt columns, 25 kilometres north-west of Melbourne off the Calder Highway. It is very close to Melbourne airport with obvious consequences. Mine was the only car in the car park when I pulled in at 8.15. I was the only person stupid enough to get up early and go birding at the Organ Pipes today. The sky was grey and no birds were singing. The first thing I saw was a feral cat, right beside the park office. My mood soured. I wandered down the steep hill, irritated by the noisy jets overhead every ten minutes. I was grumpy and wondered why I hadn't stayed in bed. Soon I was entertained by lots of Silvereyes, Superb Fairy-wrens and White-browed Scrubwrens and I thought perhaps I had done the right thing in coming here today. Three cute Dusky Woodswallows assured me that I had. In past summers, Bown Goshawks have nested in the gum trees here and their swooping kept tourists on their toes. I could see no sign of them this morning. Willie Wagtails chattered and Fairy Martins soared overhead. I strolled on to the Roseate Rock. Red Wattlebirds played overhead and Red-browed Finches amused themselves in the grass. Jacksons Creek bubbled along happily. A couple of kangaroos looked at me curiously, and were happy to sit still watching me until they saw my camera. Then they were gone. The sun came out at last, and I thought the birds would follow. It was very pleasant walking beside the creek, listening to the White-plumed Honeyeaters ﻿call to each other, while magpies carolled from the hillside. I figured that I'd got out of bed and driven through the morning peak traffic, so I deserved some good birds. That was only fair. One and a half more kangaroos came to inspect me. Again, they were quite happy looking at me until I extracted my camera. Shame I wasn't a little quicker. They were off before I could take a shot. I saw some very sick rabbits and wondered if that's what calicivirus looked like. Not a pretty sight. By the time I returned up the steep hill to the car park, I knew I'd wasted my time. Then I did what dissatisfied birders always do. I started wondering 'what if.' What if I'd gone to Banyule? There's a Little Egret and a Freckled Duck there. What if I'd gone back to Badger's Weir? Would I have seen my Superb Lyrebird this time? What if I'd gone to Fern Tree Gully or Sherbrooke? Certainly, my trip to the Organ Pipes had been a waste of time. What was I thinking? The Organ Pipes is not in my top 100 Australian birding sites. I should have visited all the Melbourne sites on that list before I ventured elsewhere. When will I learn?